You’ve probably at least seen a sagging gate if you haven’t experienced one yourself. A sagging gate is where the gate no longer lines up perfectly with the fence, causing the appearance of it sagging downwards. It might drag in the dirt, or no longer line up with the latch on the other side. A sagging gate can range from being a minor aesthetic flaw to a serious problem that keeps you from closing or opening the gate at all. The longer the problem is ignored, the worse it tends to get. So what causes this problem in the first place and how can you avoid it? If you think about it, two hinges are all that is holding the gate in place. Over time, those hinges wear out, causing the gate to shift position over time. Screws might come loose or fall out of the hinges, weakening their integrity. The hinges themselves can become damaged over time, also causing problems. The post that the gate is connected to can also become a problem causing a sagging gate. If the ground shifts after the fence is installed, the post will shift too, causing issues with the gate. If the post isn’t anchored properly in the ground, it can tilt or tip, which will also cause issues with the gate alignment. This is an issue that we see in wooden fences. The wood posts can start to splinter or become rotten, causing the position of the hinges to change. When this happens, the only recourse is to replace the damaged posts before the problem gets worse. The gate itself can also shift over time, causing it to sag. This is why gates often have a brace going from the top corner to the opposite bottom corner. This helps keep the gate in its original shape. Something that we frequently see is kids “riding” the gate by holding onto it and swinging it open or closed. This is a fun activity, but it can cause damage to your gate and cause it to sag quickly due to the extra weight and pressure. 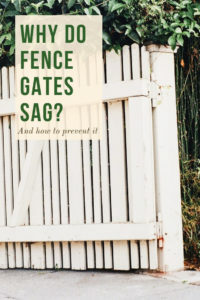 How Can You Prevent Your Gate from Sagging? When you install a fence, make sure that you take the time to do it right. Make sure that the hinges are screwed in tight, and the posts are properly anchored in the ground so they won’t shift. This will help your fence stay in place longer. No matter how well you install the gate the hinges are sure to shift at some point. This is where an adjustable hinge comes in. We’re proud to carry D&D Tru-Close Gate Hinges that feature a patented, spring-loaded adjuster within the hinges that allows quick and easy tension adjustment at the turn of a screwdriver. 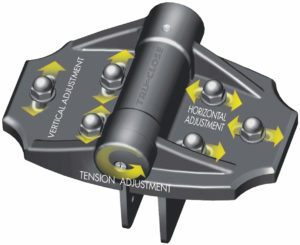 The hinge features 3-way adjustments–horizontal, vertical, and tension–to solve all of your sagging worries. Instead of replacing the hinges, you can simply adjust them back where they need to be to get much more life out of your gate. You can shop all of our fence fittings and gate hardware here. You don’t need to have a sagging gate, you just need to take the proper precautions and adjust your gate hinges as needed for a gate that swinges and latches perfectly every time!